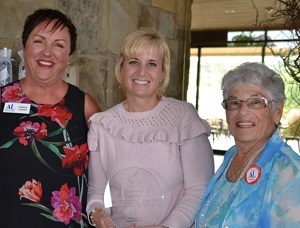 The Assistance League of Temecula Valley recently presented the National Operation School Bell® Award to Laura Boss, public information officer of the Temecula Valley Unified School District, at the league’s annual meeting at Galway Downs in Temecula. The award is available for an Assistance League chapter to present to honor someone in the community who have had a direct, powerful and positive effect on the Operation School Bell program, thus warranting recognition from National Assistance League, according to a press release from the Assistance League of Temecula Valley. Operation School Bell, the signature program of Assistance League, assists children in need by providing them with new school clothing. Last year, it became apparent that the Temecula Valley Unified School District needed a new procedure for scheduling low-income students for Operation School Bell. After discussions with program leaders, Laura Boss suggested the Operation School Bell registration process be taken from paper to online. The previous system was based on the site health clerks and nurses being “in the know” of potentially needy families. This was a disservice to district families and placed a burden on the site health clerks to make the decisions about whom to approach, according to the press release. In the school district, the annual registration process has been done completely online for the past several years. Because families have become accustomed to using the online process, this was a good time to change to the same kind of process for Operation School Bell. Online forms were created and the information sent to all district families by email, allowing families to review the information and requirements at home. In an effort to target the most needy families, the Operation School Bell application process was rolled out in phases, first to to Title I families, then to identified foster youth families. Once those emails circulated for a few days, the application was distributed to the rest of the families in the district. According to Assistance League, the responses were overwhelming and all three Operation School Bell dressing dates were filled within four days. Many families said this was the first time they had heard of the program. The online process also provided Operation School Bell volunteer administrators spreadsheets with contact information provided by thefamilies as well as information needed for the shopping events. “I am so blessed to work with the amazing ladies of Assistance League of Temecula Valley,” Boss said in the press release. “They are amazing and I want to be one of them when I retire and can dedicate more volunteer time to the organization. “For now, I truly appreciate the willingness and faith that the Operation School Bell leadership placed in me to make the transition from paper to online. We believe it is a win-win for ourfamilies and Assistance League’s volunteers,” she said. “Being recognized nationally as one of only two people in Assistance League of Temecula Valley’s 29 years is a compliment that I don’t deserve but I am so grateful and appreciative of the honor,” Boss said. Boss and Operation School Bell administrators look forward to expanding the program to Lake Elsinore and Murrieta Valley unified school districts this fall. Assistance League of Temecula Valley, a chapter of National Assistance League, is a nonprofit, all-volunteer philanthropic organization dedicated to serving the needs of local families through its philanthropic programs. The organization operates a thrift shop at 28720 Via Montezuma, Temecula. Revenue from thrift shop sales is the main source of funding for chapter philanthropic programs. For information, go to www.assistanceleague.org/temecula-valley/ or call 951-694-8018.